Mini 10is is tennis for players aged 10-and-under, played on smaller courts with slower Red, Orange and Green balls. It is a fun way to start tennis and makes it easy for children to play the game, develop good technique and tactics and develop a love for the sport. Using the slower balls helps players to develop the most efficient technique and to be able to implement advanced tactics that in most cases could not be performed using the Yellow (conventional) ball on a full size tennis court. Mini 10is is part of the CF Tennis Play and Stay campaign initiated by the ITF. 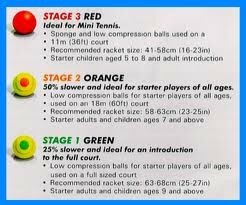 There are three stages of Mini 10is that allow players to start at the suitable level for their ability – Red (Stage 3), Orange (Stage 2) and Green (Stage 1). Ideal for mini tennis (ages 5 to 8), sponge and low compression balls are 75% slower than a conventional ball, and are used on an 11m x 5-6m court. At the red stage slower balls, smaller courts and shorter racquets enable the little ones to play tennis from their first lesson. Players are able to start to play fun, team-based matches, and develop realistic tactics while using good technique. 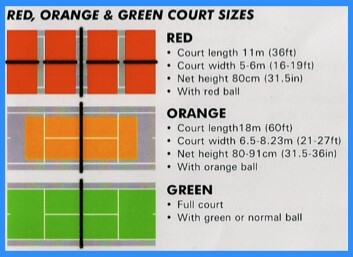 Orange balls are 50% slower and ideal for starter players of all ages (adults and children ages 7 and above), they are used on an 18m x 6.5-8.23m court. The orange ball is slightly faster, but continues to provide an optimal striking zone and the ability to implement advanced tactics. Matches are longer than at red level with kids playing individual and team matches. The green stage uses green low compression balls which are 25% slower than the conventional ball. This is ideal for player from 9 years and older. This is also played on a full size court. This helps your experienced players develop good technique and more advanced tactics. Matches are longer than those at orange level but still continuing to play both team and individual matches. CF Tennis believes it is very important that you get some professional coaching when starting off. Without it the player can develop a poor technical foundation for their strokes, which will not only severely limit your future playing level, but, over time, will also increase the chances of incurring injuries like tennis elbow.